Australia recently celebrated National Archaeology Week. During this time, Queensland Museum Curator of Archaeology, Dr Brit Asmussen participated in some Meet the Curator sessions with a focus on discovering the stories of authentic and faux archaeological artefacts collected by servicemen stationed in Egypt in the First World War. Here Dr Asmussen shares some of the history of how these items came into the Queensland Museum Collection. 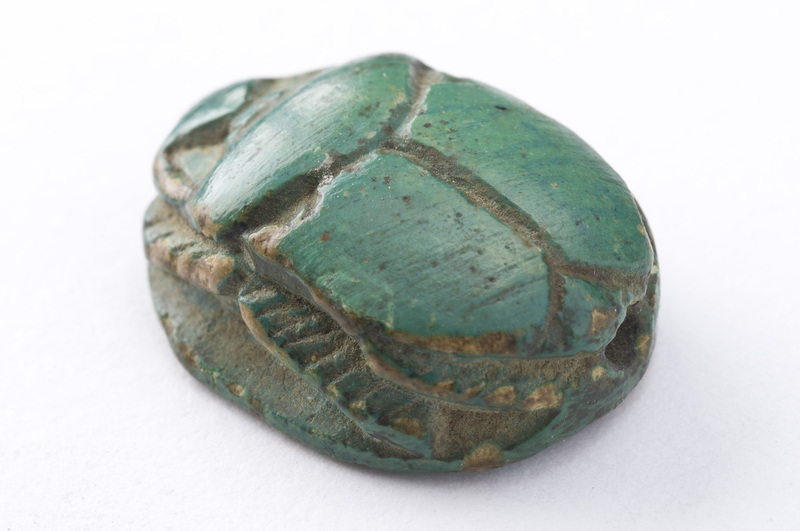 Egyptian green coloured faience scarab beetle amulet. In 1914 many thousands of men left Australia for Egypt, encountering landscapes and material culture completely unfamiliar to them. Men were trained in warfare at Mena Army Camp – against a surreal backdrop of ancient pyramids and the Sphinx. When not training, the men spent their spare time in local towns and at Cairo, surrounded by the hustle and bustle of an exotic eastern city. The men enjoyed sightseeing, climbing the pyramids, exploring temples, and acquired Egyptian ‘curios’ (in the parlance of the era -rare, unusual, intriguing objects) for themselves, at the request of friends and relatives, or as gifts for family – what would become the ‘bric-a-brac’ of war. Selling replicas as genuine antiquities has been big-business in Egypt for hundreds of years. At the start of the war the trade in Egyptian fake antiquities was large, and proved a decent money earner for street sellers in Egypt. The number of soldiers travelling through or training in Egypt would have been an absolute boon for the souvenir sellers, including those selling ‘genuine’ antiquities and faux objects ‘inspired’ by the genuine antiquities. Objects collected by servicemen while serving in WW1 are held in museum collections. Australian museums contain items such as coins, relics, fragments of tile or marble and basalt from monuments in ancient cities. 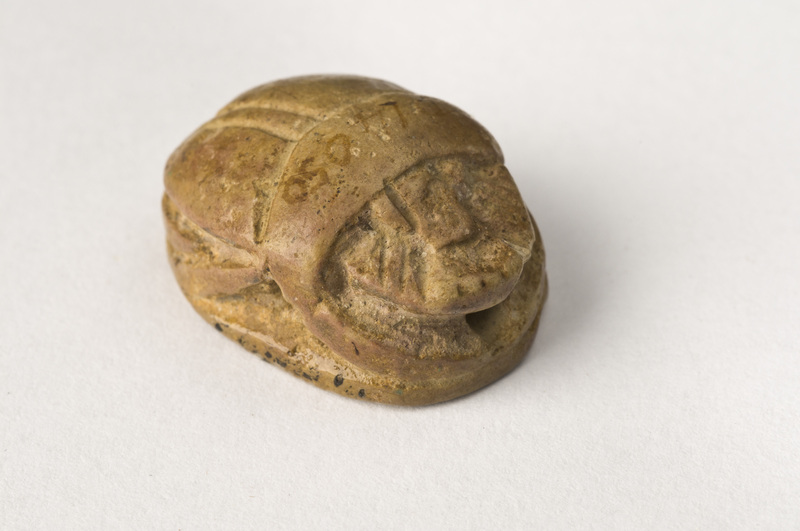 The kinds of WW1 Egyptian archaeological curios in the Queensland Museum is similar to those in other museums, and includes both authentic and faux pieces, and is comprised of four main types: scarab beetles, statuettes, coins and pieces ‘souvenired’ off buildings and monuments. Archaeological curios collected by soldiers function as repositories of memory and meaning, and for us today, part of the material culture of warfare and the British-Egyptian encounter of WW1. Queensland Museum records and those of the Australian War Memorial enabled us to shine a light on some of the Egyptian objects in the QM collection. As we celebrate and remember the contribution of Servicemen and their families in World War One, many other poignant stories will no doubt be revealed in the QM collections. Stay tuned for more personal stories of some of these items in our collection. Previous PostRailway MysteriesNext PostWhen is a bug not a bug? An excellent account of our early encounters with not-so-ancient Egypt. 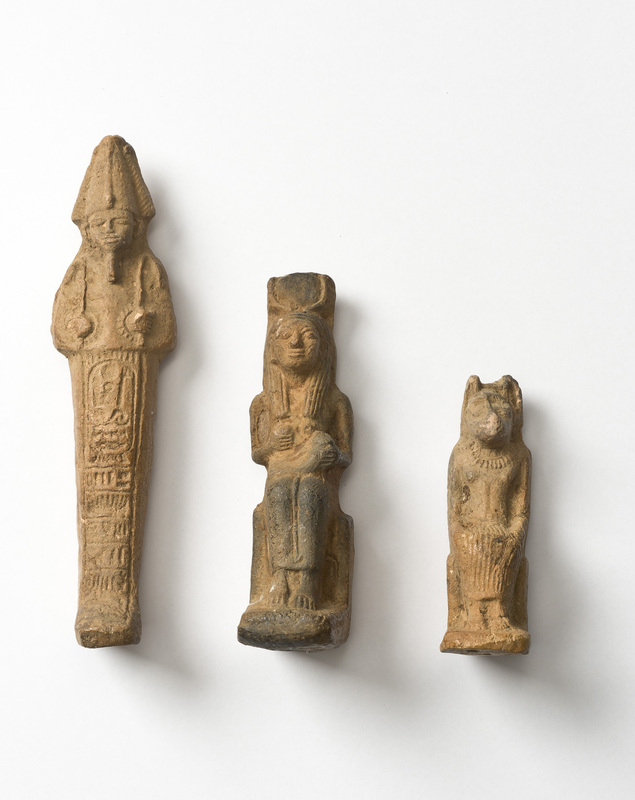 Sometimes the proliferation of Egyptian souvenirs fooled people into believing that Australia had been ‘discovered’ by journeying ancient Egyptians. One in particular – the Gordonvale scarab – found around the end of the war seems to have been a hoax that continues to catch some people out. Gordonvale in far north Queensland is sugar cane country and it was the presence of scarab beetles that led to a bounty for the collection of grubs and eventually the introduction of cane toads.